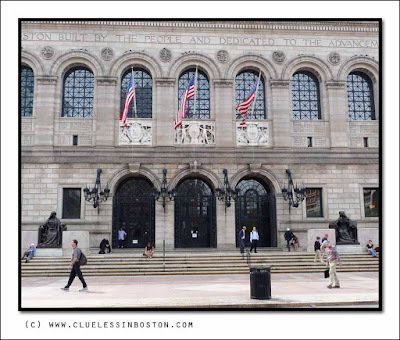 This week's doorway is the Dartmouth Street entrance to the Boston Public Library Central Library in Copley Square. The main library in Copley Square comprises two buildings — the Johnson Building and the McKim Building and is what people generally think of when they think of the Boston Public Library. However, the Boston Public Library system also has 27 branch libraries throughout the city. Beautiful. Makes me want to run inside. I believe they quality of a city can be judged by its' library. No matter how small a town, no matter how sparsely populated, you can almost always find a little library there. They are little gems. This, Slim, is a diamond of a library. The huge size and grandeur of the architecture of the main brand of the Boston Library shows the value that the city, home to so m any colleges and universities, places on education. My wife (Julie, of Scottsdale Daily Photo) and I stayed at the Marriott hotel one block from Copley Square and this library for the 4th of July holiday weekend last year. It is a wonderful area of the city. The church across the street from the library was a gem as well. I've always loved that entrance and remember when it was basically closed and inaccessible for years. I wonder if my ancestors ever used this place. Certainly their friends did, unless it's a newer building made to look in period. It's nice to see it. i really like your door and window shots and I liked your milk can shots. Truly excellent. such great light and shadows. Thanks for your comments on my website regarding the slot canyon photos. I am glad you are enjoying them. Beutiful building, nice everyday life scene.